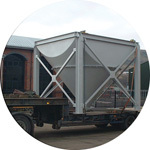 Our large fabrication bay, combined with overhead cranes, wide doorway and canopy allows us to manufacture silos and large tanks up to 4.2 metres in diameter. 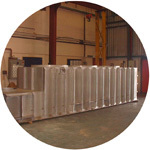 We have the capacity to cut and form a range of cones and other structures in a variety of materials. Large square to round hopper with cone. 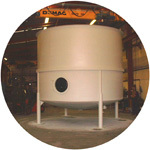 Silo for the water industry.